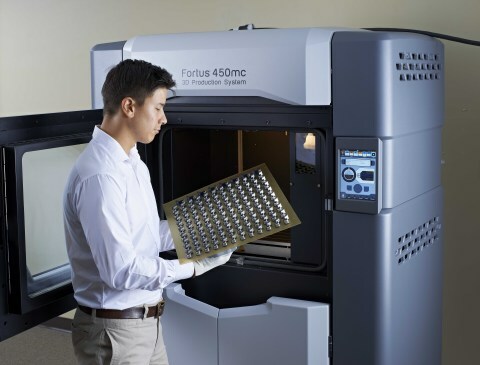 Stratasys Ltd. has introduced the Fortus 450mc and Fortus 380mc 3D production systems, which provide improved reliability, speed and accessibility. Using FDM Technology, both 3D production systems are designed to provide high-quality engineering grade parts that can be used to reduce the time to bring a product to market, create jigs and fixtures for manufacturing, as well as produce low volume end-use parts. "This new generation of 3D printers is aimed to improve the customers' overall experience," said Bill Schultz, senior director of FDM products for Stratasys. "Improved system navigation, system maintenance, and system performance builds upon the proven history of the Fortus family of products. Complex geometries now take less time to print with our new systems." The Fortus 450mc can manufacture parts up to 15 percent faster than its predecessor. It has a build envelope of 16 in. x 14 in. x 16 in. (406mm x 355mm x 406mm), and it can produce layer resolutions ranging from 0.005 in. to 0.013 in. (0.127mm to 0.330mm). A digital touch screen allows users to make adjustments to their print job without disrupting the 3D printer. The full-color display provides model and support head temperatures, calibration settings and lists print jobs in the queue. The Fortus 450mc has capacity for two model material and two support material canisters, and the usage level can be monitored using the touch screen. Industries including aerospace, government, military and medical, requiring complex functional prototypes, production aides and end-use parts in specialized materials may benefit by using the Fortus 450mc. The Fortus 380mc has the same advanced features as the Fortus 450mc including even temperature distribution in the build chamber and a digital touch screen. On average, the 3D printer can build parts up to 20 percent faster with a build envelope of 14 in. x 12 in. x 12 in. (355mm x 305mm x 305mm) with the same layer resolutions as the Fortus 450mc. Material capacity for the Fortus 380mc includes two canisters, one for model and one for support material. The Fortus 380mc is ideal for large and midsize manufacturers producing complex, smaller parts such as fixtures and tools. "We are simplifying the FDM portfolio and updating a strong product line by adding the Fortus 450mc and 380mc, giving the user a better experience," says Schultz. Stratasys offers customers three material bundles for the new Fortus Production 3D Printers. The bundles available are Standard (ABS and ASA), Engineering (PC and Nylon) and High Performance (ULTEM® 9085). The Standard and Engineering material bundle is available for both the Fortus 450mc and Fortus 380mc, and the High Performance material bundle is available for the Fortus 450mc. Users can select from one, two or all three of the material bundles to enable their system to run a range of FDM materials. ULTEM 1010 is the latest high-performance thermoplastic for FDM, offering the highest heat resistance, tensile strength and chemical resistance. Available for the Fortus 900mc, ULTEM 1010 is bio-compatible and has the only food-contact certification of any FDM thermoplastic. "ULTEM 1010 offers a new level of performance to our FDM materials portfolio," said Brendan Dillon, product manager for Stratasys. "The combination of the low coefficient of thermal expansion and the industry certifications will allow this material to enhance many current applications, and could open the door to many new users of 3D printing." Ideal for aerospace, automotive, food processing and medical device applications, ULTEM 1010 combines strength and thermal stability for advanced industrial tooling. Applications for aerospace and automotive include clips, housings and ducts. Food production tools include patterns, dies and fixtures. Custom medical tools include surgical guides, fixtures and trays.